LAKELAND – As Florida farmers prepare their fields so they can supply the nation with winter crops, Florida Conference church planters took time this week to prepare themselves for the challenges of sowing and tending the seeds of new houses of worship. Dr. Matt Lewis of Ashland Theological Seminary introduces the first session of New Church Start Academy to a group of Florida Conference church planters. Photos by Susan Green. 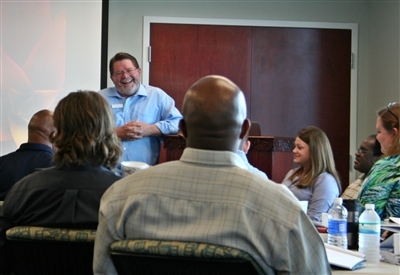 The New Church Start Academy, a program patterned after “Pastors of Excellence” at Ashland Theological Seminary in Ohio, kicked off Monday at the Florida United Methodist Center with the first of four three-day retreats aimed at pastors who are starting new churches, shepherding merged congregations or launching second-site campuses. About 20 pastors at various stages in their ministry careers took part. Most interviewed Tuesday said they were pleasantly surprised to start off with sessions that encouraged them not to forget the need for personal and family time as they tended their flocks. Rev. Harley Scalf, who’s about a year into planting Restoration UMC, Orange Park, said the message reminded him of the advice of his wife, who works with Alzheimer’s patients, to take care of the caregiver. The training is being conducted by Dr. Matt Lewis of Ashland, who has been leading 13-month programs at the seminary since 2003. Recently, Ashland received funding from the Lilly Endowment to take the program on the road in an effort to address clergy burnout. The Florida academy is the first of those off-site efforts. Training included time for reflection and small-group discussion. Each group also was assigned a Pastors of Excellence (POE) mentor. Rev. Vicki Podjasek, a church planter who currently is adult discipleship director at New Vision Church in Pewaukee, Wisc., and a POE staff member, said most groups that go through the program are ecumenical. The Florida Conference training is the first within one denomination, she said. “I’ve enjoyed seeing the bonding that’s going on,” Podjasek said, adding that participants shared their experiences without holding back. Pastors assigned to new churches, merging parishes, second-site campuses and flagging congregations in need of revitalization were invited to sign up for the training, said Rev. 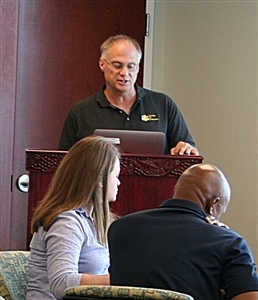 Dan Jackson, New Church Development director for the Florida Conference. Rev. Dan Jackson shares with academy participants his stories of church planting and how the "Pastors of Excellence" program helped him stay strong spiritually. New Church Start Academy members signal their affirmation during worship led by praise band Jeremy Hearns, Warren Pattison and Aaron Rios. He shared his own story of church planting and leadership, including his recollection of one merged congregation that saw its sanctuary burn six months after he took over as pastor. Even so, Jackson said he later had a “disturbing moment” and realized that he was not coping well with stress. “The problem was that deep down in my inner core … I was out of sync with who I was projecting myself to be,” he said. The experience forced him to re-evaluate his ministry and make changes. “I want to wish for you a week of holy disturbance. That is my prayer,” Jackson told the group, adding that later they would discuss techniques for increasing church attendance and raising money. Lewis shared sobering statistics about the number of seminary graduates who drop out of ministry within five years. “We graduate folks from seminary … knowing that in five years, half of them will not be employed in this thing they were convinced they were called to do,” he said, adding that only one in 10 clergy stay in their professions until retirement. Others stay in the field because that’s what they were trained to do, Lewis said, but their heart is not in it. He added: Churchgoers can tell. Dr. Devin Brown, director of discipleship and evangelism at Ebenezer UMC, Miami, said the training was different from others he has taken that focused on the mechanics of getting a new church going. He is anticipating starting a new church in the next year or so. Rev. Betsy Ouellette-Zierden said at first she was taken aback when she was invited to the training. She successfully planted a church, Good Samaritan UMC, in Tallahassee almost eight years ago. She said Good Samaritan was not an easy seed to plant in 2007. Ouellette-Zierden said she enjoyed the “joyful, fresh” perspective of budding church planters and felt she had wisdom to offer them in return.